A pair of races in Rhode Island played host to the final installment of New England’s major professional cyclocross series. East Coast hardman Justin Lindine had dominated much of the series and much of the East Coast racing for a good chunk of the season, but the tables had been turning, hinging on the Cycle-Smart International in November, when Luke Keough went two for two and took over the series lead. All eyes were on the pair to see how the series would play out. The Cannondale-Cyclocrossworld.com squad showed up with Jamey Driscoll and Christian Heule, who seemed committed to disrupt the Keough-Lindine showdown, and indeed, on Saturday, looked set to do it, as Driscoll and Heule formed a lead group with Keough clinging on. Most racing afficionados know the chances of a lone rider surviving with two teammates, but the highly capable youngster fended off a flurry of attacks and pipped the pair at the line for the victory on Day 1. Lindine finished in 6th place, only 11 seconds back, with Adam Myerson at 18 seconds rounding out what was a fairly tight-packed front of the field. That front group also included Dylan McNicholas, who’s been performing well, and Myerson’s teammate Jerome Townsend, who’s also had some impressive results of late. On Sunday, Driscoll and Heule looked determined to not give Keough the opportunity to unleash his impressive sprint, and set about making him suffer. With the large lead group trading attacks and the lead, it was only Keough sliding out in a corner that allowed Driscoll and Heule to get away from McNicholas, Lindine, and Mike Garrigan. The two stayed away from the chasers until the finish, when Heule outsprinted his younger teammate. Keough outsprinted his group for the final podium position, with McNicholas, Garrigan, and Lindine (who had crashed and suffered a mechanical) coming in behind. Keough’s third place, however, was enough for him to stand on the top stem of the Shimano NEPCX podium and collect prizes for both the Elite Men and the U23 categories. Heule’s performance put him in second place, and Lindine, who had led the series for a solid chunk, was left down in third. The real winner, though, was the series itself. The organizers pulled together an impressive professional series that attracted major names and provided high-caliber regional professional racing throughout the series. Kudos – that’s the kind of work that will develop cyclocross and bike racing in general in the United States. While the East Coast racers were playing in Rhode Island, those on the West Coast were tearing up Downtown LA – but it was Tim Johnson who showed up to spoil the party. He drove the pace to form the lead group and traded attacks with Chris Shepperd until, at two to go, Johnson had enough playing. A big acceleration left only Ben Berden and Chris Jones (unadorned by a SSCXWC tattoo, which has caused much controversy of late) able to follow. Johnson took home the victory on a day when his teammates were unable to seal the deal 3,000 miles away, with Berden in second and Jones in third. Johnson picked up his first win of the season last weekend at Jingle Cross – these victories will go a long way in boosting his confidence ahead of this weekend’s USGP race in Bend, Oregon. On Day 2, Berden came back with a vengeance, racing aggressively in an attempt to distance himself from Johnson. Again, a front group of Berden, Johnson, Shepperd, and Jones formed. Berden’s aggression finally paid off, and with two to go, he had a comfortable thirty second gap to the riders behind – enough so that the chase group did a bit of sitting up and almost allowed Cody Kaiser to connect with them. In the end, Berden won with nobody else in the picture, and Johnson outsprinted Jones to take second while Shepperd took fourth. Berden’s victory on Sunday makes one of two things clear – either he’s bounced back from a fairly quiet performance at Jingle Cross last weekend, or that Johnson’s recent victories are more about him picking the right races rather than him finally finding the form that’s eluded him thus far this season. Which is it? We’re not sure. The final bit of news coming off of the weekend is that Ryan Trebon, who crashed heavily while pre-riding the Louisville USGP race a few weeks ago, is out for the remainder of the month. Trebon had held the USGP series lead until his injury led to a 10th place on the second day of racing, and will be unable to mount an attempt to reclaim it in Bend this upcoming week. 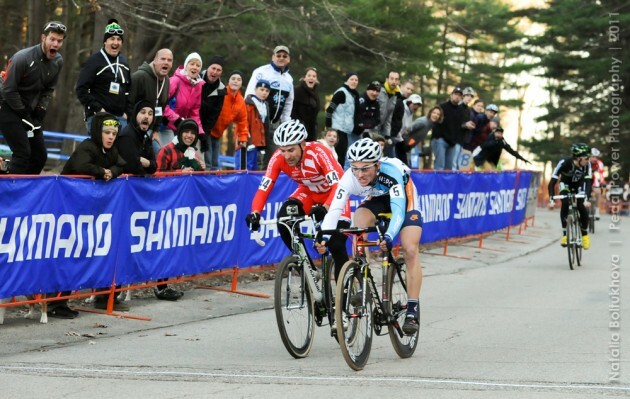 This entry was posted in Featured, Races and tagged Cyclocross, la, nepcx, north america, shimano series. Bookmark the permalink.